What if you could go wine tasting on a train through California's wine country? Sounds like a dream come true, right? Well, I had the amazing opportunity to ride aboard the Napa Valley Wine Train, and I never wanted the adventure to stop. I've gotta admit, I'm a certified wine lover. I prefer red, but white works as well. There's nothing like a sip of merlot after a long day at the office or while watching the sunset with bae. "Wine not," am I right? If you've never experienced the wine train through Napa Valley for yourself, I'm here to tell you exactly what it's like. Last year, I made a friend while exploring Greece and we wanted to meet up once again. I was traveling through California and previously read about the Napa Valley Wine Train, so I suggested this to her. We both love wine and wanted to catch up after a year of being apart, so we couldn't think of a better experience to do together. A few weeks later, we met up in San Francisco, rented a car, and road-tripped it to California's Napa Valley. 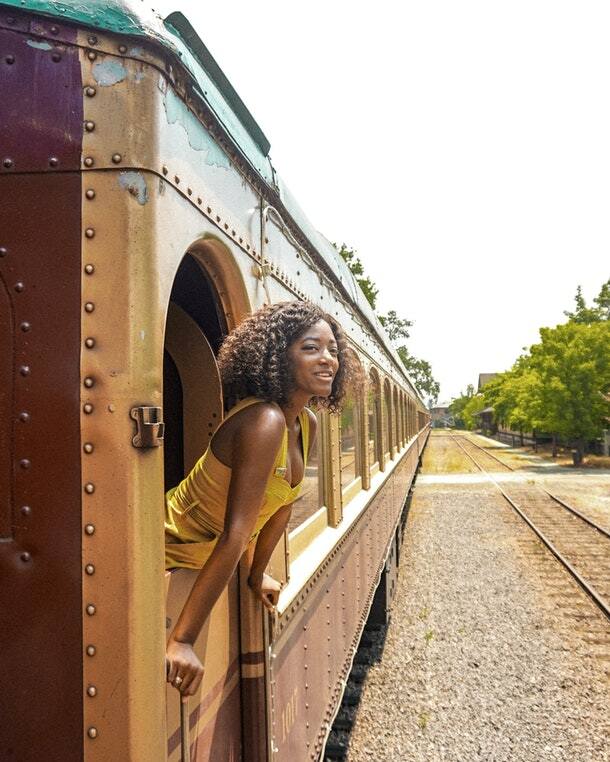 Before I knew it, we were coasting through vineyards on a certified wine train, living our #bestlives. As soon as we stepped foot inside the train, it felt like we were stepping back in time. The interior had a lavish vintage vibe, which I immediately fell in love with. Honestly, I felt fancy AF and knew that we were about to have a grand time off the bat. We began the journey with a champagne toast to a "wild ride." We then continued to eat and catch up over a three-course meal while marveling at the rolling vineyards just outside the train's windows. I mean, how often do you get to ride a beautiful train while toasting the bubbly in 2018? This is such a unique way to travel, and I loved sharing this experience with an old friend. I couldn't imagine experiencing Napa Valley any other way. We sipped and cheers while swooning over the views that looked like they popped out of a postcard. The train ride stretches over 30 miles long, so we were able to see parts of Napa that you might not think of exploring. It felt good to sit back, relax, drink wine, and just enjoy the ride. We passed by endless rows of lush vineyards and wine estates. The Napa Valley scenery is much more beautiful than I ever imagined it would be. We rode by a number of quaint towns before we arrived at the good part - the wine! Soon enough, it was time to (literally) stop and smell the rose. This is the part we we're waiting for: the wine tasting. I've gone to wine tastings before, but never by train. Somehow, this made the wine tasting even more special. We visited Charles Krug Winery, where we learned all about the history of Napa Valley. We had many glasses of fine wine before visiting my personal favorite winery in the region: Raymond Vineyards. This winery is youthful and eclectic. I loved touring the property, and lets be real: I loved drinking the wine! Let me just say, this experience is certainly one for the books, and I highly recommend it. I couldn't think of a better girls' trip.